These taste as good as they sound. 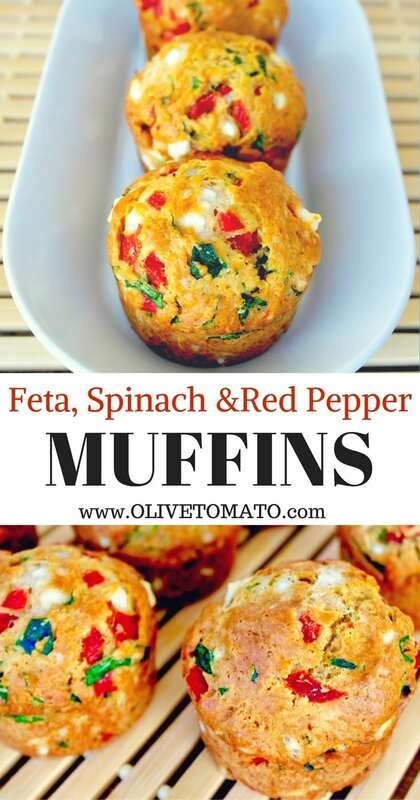 Normally we associate muffins with something sweet, but let’s get away from sweet snacks and breakfasts and try something savory. 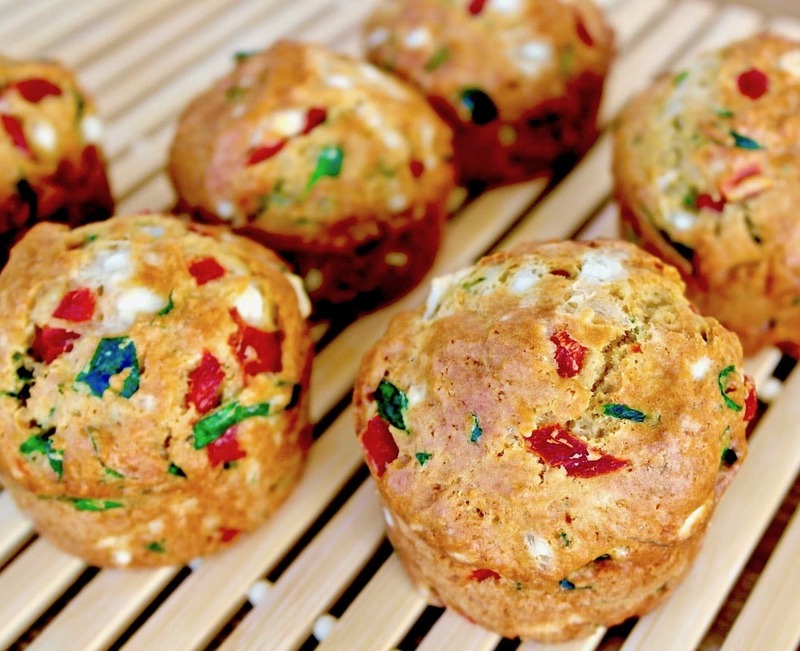 These feta and spinach muffins were inspired by a recipe I saw in an old issue of Bon Appetit and made a bit more Greek and Mediterranean. Obviously, I used a mild extra virgin olive oil instead of the generic vegetable oil the recipe recommends. It pairs beautifully with the feta, spinach and the red pepper. The peppers I used here are the Greek red marinated peppers known as Florina peppers (Piperia Florinis) which are cultivated in the Greek region of Macedonia near Florina. I had the opportunity to spend some time there during New year’s. These peppers are sweet and usually served with olive oil and vinegar as a meze. I also use them in sandwiches, with rice, pasta and quinoa too. They are delicious and you can get them roasted in a jar or fresh (in Greece). If you are not able to find them, you can use regular jarred red peppers. The kids loved the muffins and had them as a snack and for breakfast the next day. 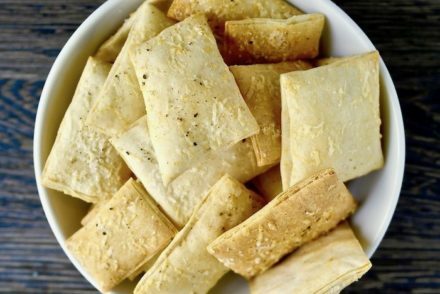 They are great as an appetizer or as an accompaniment to a large salad. I used baby spinach but as long as you cut the spinach very thinly it will blend in fine. You can also substitute some of the all purpose flour with whole wheat flour. When using feta, make sure you do not buy already crumbled, it may not be as fresh and there are other ingredients often added to it. Greek feta (in Europe only Greek feta can be called feta) is preferred, but if you are unable to find it, make sure the feta you do buy is made with sheep’s milk not cow’s (there is no such thing as cow’s milk feta). Check here for more tips on buying feta. In another bowl mix the olive oil, eggs, milk. Add the wet ingredients to the dry ingredients and mix just until blended with a wooden spoon. The dough will be thick. 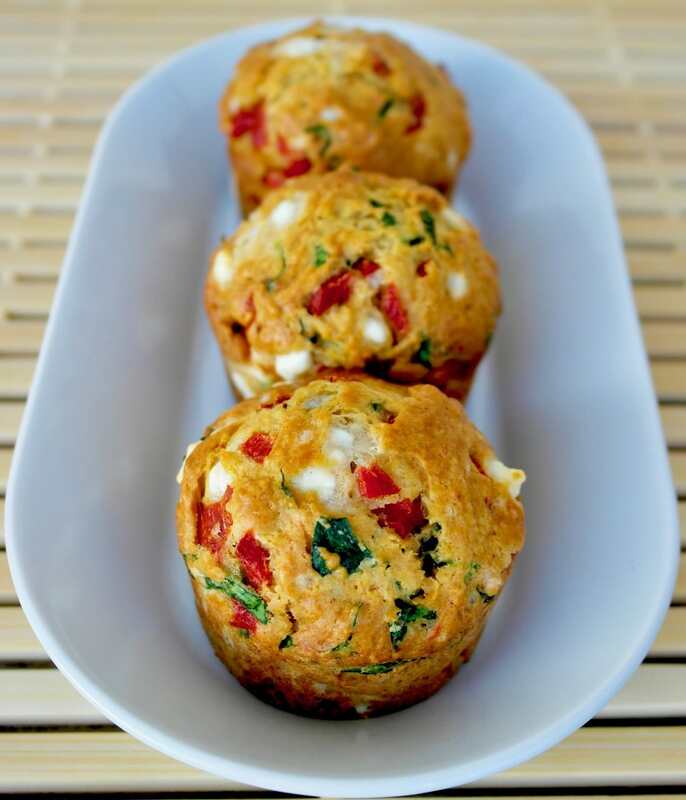 Add the feta, spinach and peppers and mix gently until all ingredients are spread throughout the whole mixture. Divide mixture in muffin pan that you have lined with muffin/cupcake liners or you can use a silicon muffin tray and grease it with a bit of olive oil (I have used it here). You should have enough for 12 medium muffins. Bake for about 25 minutes. Remove when toothpick comes out clear when inserted in the muffin. Let them cool for 10 minutes and remove from tray. Let them cool a couple of hours before serving. These muffins were just delicious! 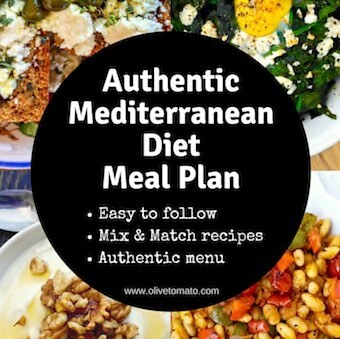 Very colorful, added nutrition with the olive oil, peppers, and I served it with some roasted salmon and roasted asparagus and it was a perfect meal. 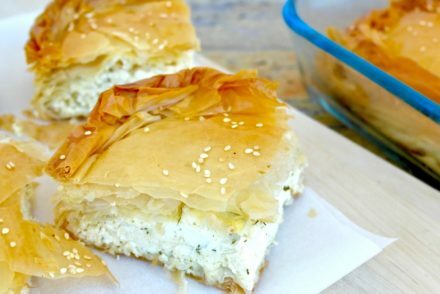 – even some protein with the feta! Just lovely! I served it with some roasted salmon and roasted asparagus and it was a perfect meal. Thanks for sharing Nancy! Nice combination! 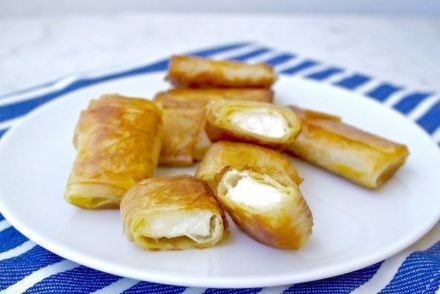 They look amazing and I’ll be doing a batch today – I’m just wondering if these freeze well please? Yes, just make sure they are completely cool before freezing. Great additions Damen, thanks for sharing! These look wonderful. Have you tried them with honey instead of sugar? Also do you recommend the marinated or jarred peppers over self roasting them? I cannot wait to try these. Hi Linda, I used jarred Greek peppers, as they are marinated they have a somewhat ore intense flavor, but I think grilled peppers would be interesting too. What if you can’t find jarred peppers can use use red bell peppers from the shop? It will have a slightly different flavor, and I recommend you saute them a bit before you add them to the dough. Ive been going to Turkey since I was 5 becuase we have family there. The feta there is the greek style as you call it, but obviously they just call it feta there. You mentioned that there is no such thing as cow’s milk feta and there actually is such a thing. When we go to the grocery in while in Turkey we often have to request the sheep or goat milk feta. Im not sure about Greece in particular, but cow’s milk feta does exist. While in the states we prefer a brand of feta that tastes the most similar to the one we can get in Turkey that is sheep feta from France called Valbreso. Recently its been popping up in more stores. What should the red pepper marinade consist of? There are a few such products available at our grocery store, but none are specifically Greek, and the ingredients include things like “f irming agent” that I doubt are anything I’d want in my food. I’d like to try roasting and mar inating my own fresh peppers. Thanks for a wonderful site. I’m slowly converting my white bread and mayo husband with your recipies!